Toby, VE7CNF, has sent me some mail indicating that his new lightwave system is ready for a two-way test! His system is very similar to the ones built and deployed by myself and Markus, VE7CA, in late 2013. The culmination of that activity is described here, in 'On Making Nanowaves - Part 6'. Our lightwave QSO and homebrew gear were later described in a 'how to' article in the 'The Canadian Amateur' as well as in the newest edition of 'The Radio Amateur's Handbook' (2016). when the transmitter's on it. Back scatter off the clouds above my house worked too. I heard my CW beacon, audible 339, off a patch on the clouds about 1 degree wide. I don't really know if it was clear air scatter from closer by, or scatter off the clouds, but the spot was small. That's with the tx on the front deck, and rx in the back. 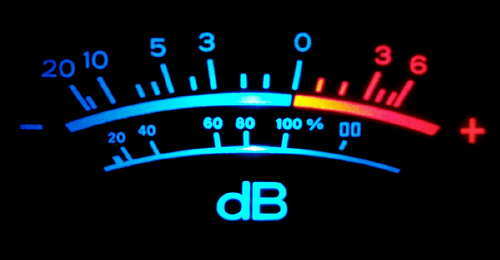 strong, but those are some frequencies we should avoid. As well, Mark, VA7MM, is also putting together a similar system to join the fun ... it's great to see new local activity! Hopefully the weather will co-operate enough to allow us to make a two-way QSO later this week. Plans call for Toby to set up near the same location in West Vancouver used by VE7CA as it offers a clear LOS path to Mayne Island, 54km to the southwest. Rik, ON7YD, has set up a new website devoted to information specific to 630m. His 472kHz.org site looks as if it will be a valuable resource for those looking to get information and a start on our new band. At present, there is some really great information regarding transmitters, antenna systems and calculating E(I)RP levels. Have a look! As the rollout of new LF and MF ham bands grows closer for U.S. amateurs, earlier this month, the ARRL requested the FCC to carefully consider the procedural requirements governing the advance notification of local electric authorities of their intended 630m / 2200m operation. The FCC had suggested that under certain circumstances (mainly the distance to the nearest PLC signal-carrying power lines), amateurs would be required to notify and co-operate with power authorities ... but it was all very vague and seemed to place the conditions under which operating authority would be granted into the hands of the power companies. “ARRL does not object to such a notification requirement, provided that it is appropriately circumscribed, not overbroad in its applicability, and not overly burdensome for radio amateurs to comply with,” the League’s statement asserted. In addition, the power authority Utility Telecom Council (UTC) has been notably silent on the issue ... slowing the process even further. 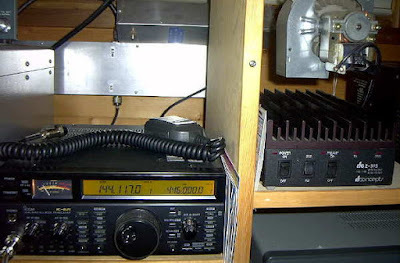 "The ARRL noted that comments filed by the Utilities Telecom Council (UTC) called for a system of “quasi-coordination” by radio amateurs before commencing operation on 2200 meters (135.7-137.8 kHz). In its remarks to the FCC, the ARRL pointed out, however, that the UTC has not volunteered any information with respect to how a notification process might work nor offered any PLC database information to the ARRL or to the amateur community so prospective users of the band could determine if their operation might be problematic." 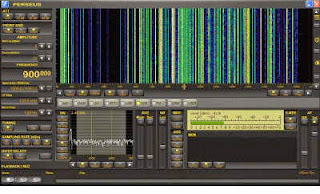 The League took the opportunity to remind the FCC, once again, that the low ERP levels generated by amateurs operating on the new bands would have a low probability of creating any interference and further pointed out that PLC systems operating between 9 and 490 kHz are not subject to protection from licensed services. 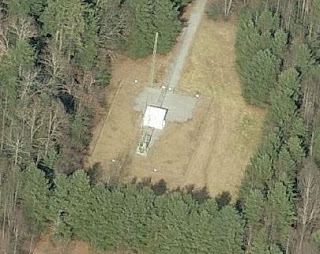 The ARRL also indicated that any sort of blanket notification requirement prior to transmitting on 2200 or 630 meters “would be clear regulatory overkill,” and that utility companies should clearly be required to demonstrate how amateur operations would cause harmful interference to their PLC (unlicenced) operations. It's good to see the ARRL still being proactive with regards to procuring these new frequency allotments on behalf of U.S. amateurs ... hopefully making implementation sooner rather than later. The entire ex parte filing can be read here as well as the ARRL's own news posting of the procedure here. In the meantime, I'll make yet another call-to-arms to fellow Canadian amateurs, who already have these two new bands but aren't using them ... new activity from the western provinces would be especially welcome as there are a now a number of well-equipped stations in VE7 who would like to work you. This past week provided the month's best moonrises for my location, when the moon's position traversed its most northerly declinations. The afternoon moonrises directly in front of the house and over the ocean, provided about 90 minutes of 'moontime' for several days in a row. 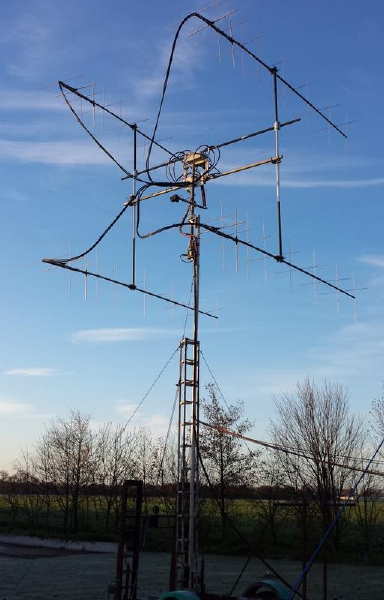 My minimal system (single 9el Yagi and 140w) makes it very easy to see the day to day changes in EME conditions due to various causes such as local geomagnetic conditions, Faraday rotation and libration fading ... or combinations of each! One of the days was particularly good, with numerous signals heard throughout the session while the next day was just the opposite, with only a few very weak signals and no contacts. 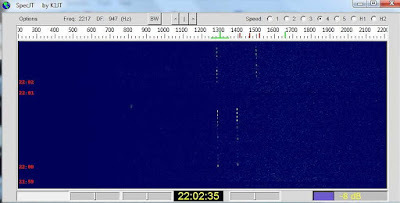 On that particular day, I was being heard well by several European stations but was unable to hear any of them ... a true 'one-way' path and not uncommon on EME. My small EME station. Note old microwave oven blower on the 'brick' amplifier. Several smaller 4-Yagi stations were worked during the week, re-enforcing the benefits of having a moonrise over the ocean. As mentioned previously, the extra 6db of horizon gain allows my single 9el Yagi to perform more like a stack of four 9el Yagis. One of the fellows that I worked, DK5EW in Germany, asked if there was anything 'special' about my location that would make my very small station sound so strong at his end ... the ocean is clearly doing its job! Altogether, 12 new stations were worked during March's window, bringing my total to 70 "initials". From the looks of the amount of activity, there are still many stations yet to work, that should be within range of my system. I2FAK, UA3PTW, RZ3BA/1, SK5AA, PA2CHR, ES3RF, YO3JR, PA5Y, DK5EW, SM7GVF, EA4CYQ and W5ZN. Three of these stations were using relatively compact antenna systems, consisting of 4x8el or 4x9el arrays, while the rest were larger. I have yet to tally up my DXCC or states total on 2m, but I know that W5ZN, in Arkansas, was a new state. Up until this past week, the highest moon elevation that I have completed a QSO was with the moon at 18 degrees above the horizon. This week it was extended, at what is probably the limit of my fixed antenna, to 19.6 degrees when working ES3RF. At the other end of the scale, IK2FAK was worked with the moon at only .87 degrees high! This month also provided my first glimpse of a 2m DX 'pileup', when J8/WW2DX in the Grenadine Islands showed up, calling CQ via the moon. My screen shot below shows at least 12 different stations calling him during his one-minute listening period ... some not yet 'warmed-up' as seen by their drifting oscillators.With several of the signals audible, it was an amazing thing to observe. All in all, March's short sessions were very rewarding but as summer approaches, more of my well-placed moonrises will also be very close to the Sun and it's associated higher noise levels ... probably something my little system will not be able to handle so well. 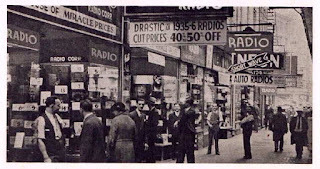 Most likely, every large city had their own version of 'Radio Row', back in the 30's or later and for many radio fans, a Saturday morning visit was the highlight of the week. As a young shortwave-crazed kid in the 50's, there was nothing that I looked forward to more than the weekend and being able to stay up as late as I wanted, tuning the bands on my big old GE cathedral ... high up in my third-floor attic bedroom shack. But number two on the list was my weekly Saturday morning trip, by bus, to Vancouver's north Granville Street and then on to the library. There I could read the latest radio magazines as well as look at their huge archived collection of earlier issues. In the 50's, there was a three block strip of radio shops on the north end of Granville street, just after the bridge into downtown Vancouver. I imagine that it was similar to many other 'Radio Rows' ... kind of a mix between old and new and a little on the seedy side. It was a six or seven block walk from the bus stop to the radio stores and then another dozen back again to the library. The winters in Vancouver were always wet and dreary and I'd invariably get drenched in the process (I learned very early, that for some odd reason, Vancouverites never carried umbrellas! ), but hey ... I was crazy about radio and what was a little rain. During this same time span, once or twice per year, the family would pile into Dad's old Chevrolet and we would make a road-trip to Seattle. Unlike the present, our Canadian dollar was worth more than the American dollar back then, so there were always some great shopping bargains to be found. 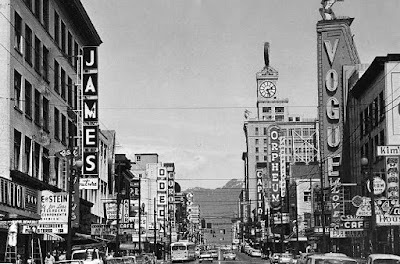 I recall there being a number of old radio shops as well as several surplus stores just south of Pike Street, on 1st Avenue as well as a few more, one or two blocks down the hill toward the docks. Maybe these were the last vestiges of Seattle's version of 'Radio Row'. Of course nothing compares with the original 'Radio Row', located in the lower Manhattan district of New York City. It was born along with radio itself and by the early 30's the Cortlandt Street neighbourhood was blanketed with shops selling radios to consumers and components to builders. A Saturday morning trip to the Cortlandt Street paradise was a ritual for hundreds of radio fanatics for more than four decades, as seen in this timely old film taken one typical (Saturday?) morning on New York's 'Radio Row' ... what an amazing time it must have been! "Radio Row's popularity peaked in the 1950s. Its proximity to the New Jersey ferry docks and the financial district, combined with the advent of new consumer electronics goods and postwar demand, attracted floods of shoppers to the area every day except Sunday. To service their customers, stores opened at 7:00 a.m. on weekdays and closed late on Saturdays. Radio Row was not a neat and pretty sight. Block upon block over 300 street level stores, with over three times as many enterprises in the floors above them were jammed into 20 to 25-foot storefronts, up and down streets such as Albany, Carlisle, Greenwich and Liberty. Their shelves and floor spaces were packed with vacuum tubes, condensers, transistors and other high-tech bric-a-brac for ham radio enthusiasts and do-it-yourselfers. It was, as the New York Times called it in 1950, "a paradise for electronic tinkerers." 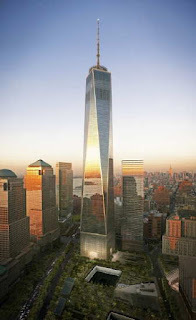 "
By the mid sixties, only a few radio shops remained and after some very bitter court battles, the remaining merchants were 'bought out' and the Cortlandt Street area was cleared so that construction could begin on the World Trade Center's twin towers. Today, the area is now home to One World Trade Center, the tallest building in the U.S.A. and to the 9/11 Memorial ... now all sacred ground. I was in New York City, three years after 9/11 and recall looking with much sadness into the multi-block deep hole in the ground ... how much happier it must have been there, back on those wonderful Saturday mornings, on 'Radio Row'. 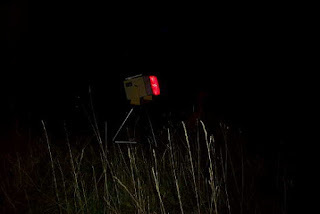 K7RA's 'Solar Update' in this week's ARRL News, mentions Jeff Foust's recent article in 'The Space Review', reminding us again of the dangers posed by a modern-day 'Carrington Event', also known as the 'Solar Storm of 1859'. A large solar flare in late August, hurled a monster-sized CME towards earth, making the 93 million mile journey in just 17.6 hours compared with the more normal rate of several days. Huge auroras soon lit up the sky as far as central Mexico, Hawaii and the Caribbean. The aurora was so bright, it was reported that Rocky Mountain goldminers awoke in the middle of the night, and thinking morning had arrived, started to prepare breakfast. Telegraph lines and equipment burst into flame while some circuits continued to be usable with power supplies completely disconnected. The 1859 event still remains the most geoeffective solar storm since records have been kept. Such an event today, of course, would wreak much more havoc ... probably having devastating consequences for decades and causing trillions of dollars of damage. Was that, though, just a fluke event? 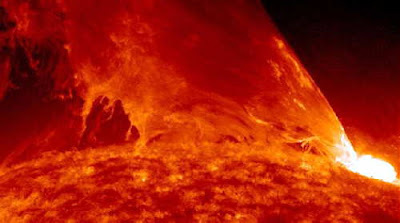 .... Pete Riley, senior research scientist at Predictive Science Inc., offered a probabilistic forecast for the likelihood of another Carrington-like event, based on that storm’s estimated strength and measurements of the actual strength of solar storms over the last few decades. “If you the (sic) time between events, you can calculate the probability of the next event occurring within some unit of time,” he explained. 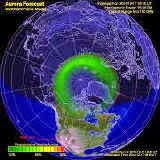 Interestingly, for this prediction, the actual strength of the solar storm of 1859 can only be estimated. If it was actually twice as strong as thought, then the probabilities drop from a (decade) 10% probability to just a 1% chance. The U.S. government has recently set up a NASA multi-million budget funding proposal to study the likely effects of future large scale impacts and possible “response and resiliency capabilities” but it's not known if these will carry over to any new administration. I think it is excellent that there are steps being taken to improve our understanding of the probabilities and predictive accuracy of such solar events, but I'm concerned that it isn't entirely clear how that information will translate into major investments in civil engineering that will make us less vulnerable to them. As for asteroidal impact threats, it's one thing to have a observations and research that will provide predictive information, and another to prevent tragedy. In both cases, it's about how we'll actually prevent such destructive effects once predicted. Prevention is a LOT more expensive than prediction, and is thereby ripe for threat denialism, which seems to be an emotion that has thoroughly infected at least the leaders of our nation. It's a little funny about how much energy is being spent advocating human spaceflight for colonization and settlement as a means to save the species, but so little is being devoted to specific threats to the species, and to individuals in particular. I could get killed in an asteroidal impact or a severe geomagnetic storm, but sending a shipload of people to Mars sure isn't going to protect me. I am a member of Infragard, which is dedicated to supporting efforts to protect us from risks to our electrical grid and other critical infrastructure. A novel "One Second After" by William R. Forstchen accurately illustrates the effects of a similar intentional attack on our grid and how it creates a cascading collapse of our society. Gas stations cannot pump gas, food rots in the stores, more food cannot be delivered to all the needed locations, and the people who know how to fix things cannot reach where they are needed and also starve to death. The result of a severe Carrington event with no effective preparation or protection for the giant transformers could thus cause most of our population to starve in a few months. This risk is about 1% to 0.5 % per year and is like having everyone playing Russian roulette once a year with 200 pistols where just one is loaded. A modern day 'Carrington repeat' does indeed give pause for thought but perhaps the generally predicted upcoming 'grand solar minimum' will buy scientists some extra time to come up with solutions for what will eventually occur ... and, one more thing's for certain ... it'll be a heck of an aurora! Those of you that have been following the recent set of four YouTube videos posted in my recent PAØRDT Miniwhip Shakedown blog, regarding the care and feeding of the PAØRDT active e-probe antenna, may be interested in a fifth video in the series, posted by Mike in the U.K.
PAØRDT's recent modification of the isolating transformer, in the miniwhip coupling unit, provides much better immunity to common mode noise-coupling in the HF bands. Mike shows the installation and operation of the new unit along with some additional grounding out at the antenna. Those of you that are looking for a possible solution to relatively good reception on LF or on the 630m band, might find the answer with a carefully thought out installation such as the one shown in Mike's video series. Although living in the suburbs often means dealing with a lot of noise, particularly on LF / MF, Mike's system shows that excellent low noise reception is indeed possible. It is important to 'probe' your backyard with the antenna itself in order to find the quietest location for installation. More information on the PAØRDT miniwhip and other low-noise LF / MF antennas may be found in previous blogs here. How often have you struggled to pull a weak signal out of the noise? "Just give me one more db", you tell yourself. A recent posting to the Topband reflector by Frank, W3LPL, sent me to the interesting webpage of Dave, AB7E. Dave had been pondering two antenna systems, one of which would provide a 2db improvement in forward gain but at a much higher cost ... he wondered if the extra expense would be worthwhile and could he even hear the difference that 2db would make? He created a series of CW files, incrementing the signal level in 1db steps to see for himself! Now I've always been told that you need to increase signal strength by at least 3db before your ears can detect any difference ... but listen carefully and you may be in for a surprise, as AB7E discovered. 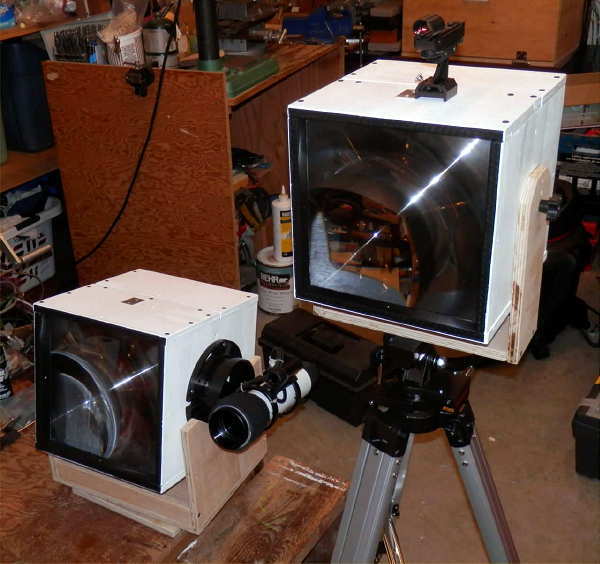 The following recording has two signals, one of which is one db louder then the other. Can you hear the difference? the performance of them, we would mix the test signal with white noise. other words, for every dB improvement, you get one tenth the errors." Now Dave never did tell us if he bought the bigger antenna or not but I'm betting that he did ... it looks like "just one more db" may really be just enough after all. I've been fascinated with the ham radio gear and activity of the late 20's for a number of years, ever since getting a bundle of 'Antique Wireless Association' journals from Harry, VE7AIJ. Many of the issues described in detail, the construction of simple '1929-style' transmitters, and once I learned that there was an annual '1929 QSO Party', I was hooked. Knowing of my interest in early radio, Paul, K7CW, recently sent me a link to a truly delightful piece of old 16mm 'home movie' style film. The footage appears on the Santa Clara County Amateur Radio Association's website where a description of the film places it in or around San Jose, California and likely filmed over a number of months from early 1925 to 1926. These were the very early days of ham radio ... the 'wild-west' in terms of rules, frequency allocations and enforcement. Hams operated throughout the LF / MF spectrum and it would not be unusual to find them working ships at sea or trying to work the latest geographical expedition to the Arctic or to some other far away place. It was also the transition period from spark to carrier-based communications, with RF generated by tubes and not with rotary high-voltage generators. 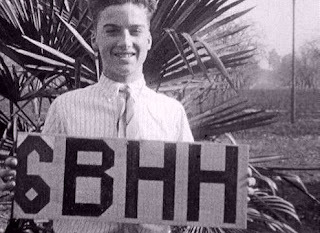 The film shows the radio 'boys of '25' (and girls! ), now all so long gone, when they were young and full of life. We see them meeting, playing in the California sun and proudly showing off their shacks and equipment ... occasionally mocking those 'new-fangled' transmitting tubes, soon to replace their much-loved spark generators. I hope you enjoy this treasure from the past ... I'm sure the 'boys of '25' would be delighted if you do. With a very quiet sun for the entire week, this past weekend's CLE proved to have much better conditions than normally experienced. Conditions were 'good' but not 'great'. Really 'great' nights are few and far between but with the rapidly declining solar cycle, we should see more and more of these over the next few winters. Most listeners around the world reported good conditions, with the nod going to Friday night as being the best. I thought that all three nights were good, but heard nothing new on night number three. A surprise catch, with a good signal, was 'BRA -379' in Asheville, North Carolina. It's classified as an 'H-class' NDB and is an outer marker locator. I believe the H-class indicates a 400W transmitter and with the large vertical antenna, seems to get out very well. 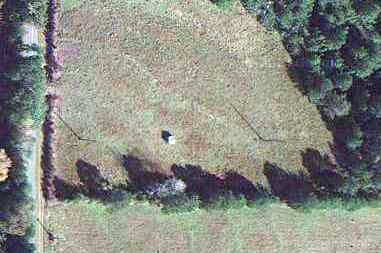 Even more surprising was 'SPH-375' located in Springhill, Louisiana. 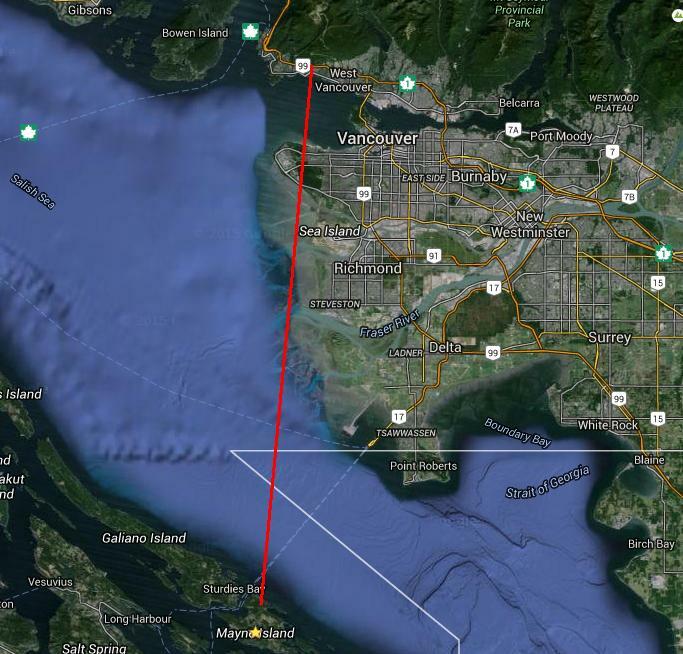 It is an LOM ndb, being co-located with the runway's ILS outer marker. The beacon appears to be using the classic "T' as seen here and is likely in the 25 watt range. As I mentioned earlier, I was rather dreading this CLE since my local blowtorch pest signal (AP-378) was smack in the middle of the CLE's frequency range. 'AP' is located 6/10ths of a mile from me, just down the shoreline and has a huge signal here. Fortunately, Perseus has an extremely effective 'notch' filter, and this, along with putting 'AP' in my LF loop's null, allowed me to hear two other NDB's beneath it ... 'ZFA' (Faro, Yukon) and 'UX' (Hall Beach, Nunavut). The following 44 stations were heard on the Perseus SDR while using either the LF loop or my inverted 'L', tuned to 370 kHz. 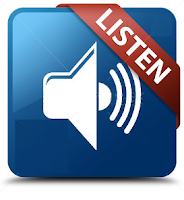 The listening results for all North American listeners and those outside of Europe can be found here.